Stats: 64.5 metre, Benetti, 2009, 12 guests, 19 crew Highlights: With impressive deck space and an armada of water toys there's never a dull moment on board Silver Angel. Among her star features, a chic sundeck plays host to a mosaic Jacuzzi surrounded by sunpads, encompassed by glass windbreakers to protect guests from the elements while still allowing for spectacular views. There's plenty of al fresco dining and lounging areas, including a sun deck bar, for those who want to make the most of the Caribbean sun. Plus, Silver Angel's enormous water toy collection promises hours of entertainment, including jet skis, an inflatable slide, scuba diving equipment and towables galore. Where to find her: This winter find her cruising through the turquoise waters of the Central and South Caribbean sea. 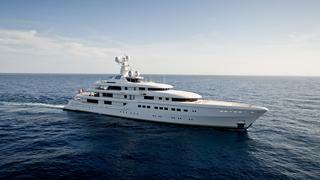 Silver Angel is managed for charter by Camper & Nicholsons with a weekly rate starting from €425,000. Highlights: With impressive deck space and an armada of water toys there's never a dull moment on board Silver Angel. Among her star features, a chic sundeck plays host to a mosaic Jacuzzi surrounded by sunpads, encompassed by glass windbreakers to protect guests from the elements while still allowing for spectacular views. There's plenty of al fresco dining and lounging areas, including a sun deck bar, for those who want to make the most of the Caribbean sun. Plus, Silver Angel's enormous water toy collection promises hours of entertainment, including jet skis, an inflatable slide, scuba diving equipment and towables galore. Where to find her: This winter find her cruising through the turquoise waters of the Central and South Caribbean sea. 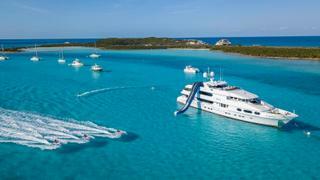 Silver Angel is managed for charter by Camper & Nicholsons with a weekly rate starting from €425,000. Highlights: Ohana is the perfect charter option for those looking to sail their way around the Caribbean this winter. With a grey hull and whitewashed oak interior, she is a beautiful yacht with an impressive racing history - she competed in this year's Loro Piana Superyacht Regatta - as well as a proven charter record. Ohana boasts a wide array of water toys including waterskis, wakeboards, paddlesboards and diving gear which can all be launched from the fold-down swim platform. Plus there's an onboard sailing and windsurfing instructor to show you the ropes. Where to find her: Whether you're after high performance sailing or peaceful cruising, make the most of the Caribbean's top sailing spots on board Ohana. Highlights: Previously named Party Girl, this superyacht is packed with amenities for having fun in the winter sun including a Jacuzzi with a swim up bar and a great array of water toys, including a slide, jet skis and jet surfers. Her spacious sundeck also has a large bar area and barbeque grill for long al fresco lunches. Milestone’s interior was designed by the Pavlik Design Team and has six stylish cabins, which feature classic maple and sycamore joinery. Where to find her:Milestone can be found island hopping in the British Virgin and US Virgin Islands this winter. Highlights: Perfect for those looking for a blow-out winter holiday without breaking the bank Renaissance is packed with all the luxuries you would expect from a yacht of her size. Her fly bridge has a large Jacuzzi with a sunbathing area and an expansive bar, which is a perfect space for entertaining. She also has wide range of toys and tenders and can offer dive charters. Where to find her:Renaissance will be spending her time between Florida and the Bahamas this winter. Stats: 70 metre, Feadship, 2016, 12 guests and 17 crew Highlights: Spanning five decks, Joy offers plenty of outdoor space with enormous sunpads on both the main deck and sun deck, and bifold glass walls that allow for flexible dining so guests can enjoy the views whatever the weather. She is also packed with fitness and wellness amenities including a foredeck basketball court, a well-equipped indoor/outdoor gym and a spa. Other star features include a sky lounge cocktail bar and a beach club that can be converted into a disco or cinema. Where to find her: She’ll be leaving her Mediterranean cruising crowds and heading to the Caribbean for some winter sun. 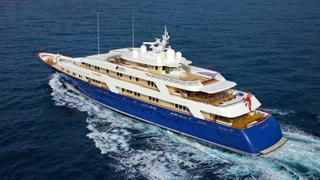 Joy is managed for charter by Burgess with a weekly winter charter rate starting from €700,000. Highlights: Spanning five decks, Joy offers plenty of outdoor space with enormous sunpads on both the main deck and sun deck, and bifold glass walls that allow for flexible dining so guests can enjoy the views whatever the weather. She is also packed with fitness and wellness amenities including a foredeck basketball court, a well-equipped indoor/outdoor gym and a spa. Other star features include a sky lounge cocktail bar and a beach club that can be converted into a disco or cinema. Where to find her: She’ll be leaving her Mediterranean cruising crowds and heading to the Caribbean for some winter sun. Joy is managed for charter by Burgess with a weekly winter charter rate starting from €700,000. Highlights: Delivered earlier this year, this sporty new Custom Line has been designed to bring the outside in with floor to ceiling windows in the main saloon and an enormous glass aft door. Guests can enjoy the Caribbean climate up on the sun deck where there’s a bar, a large Jacuzzi surrounded by sun pads and overhead awnings, while the foredeck boasts additional sun pads and seating area with retractable sun umbrellas. Where to find her: Cruising the Caribbean all year round she's right at home in the turquoise waters and knows all the best stop-offs. Stats: 72 metre, Tankoa Yachts, 2018, 12 guests and 18 crew Highlights: Make the most of Solo’s Caribbean cruising grounds up on the sun deck, offering 360-degree views with sofas and sunpads, perfect for an afternoon of sun soaking. Drop down a deck and there’s a bar, Jacuzzi and a touch-and-go helipad that can be transformed into a dance floor. If that isn't enough, she also boasts a six metre aft deck swimming pool and a large superyacht beach club, complete with its own saloon, bar, sauna and hammam. Where to find her: Delivered earlier this year, Solo will be heading across the Atlantic for the first time and will be available for charter in the Caribbean and Bahamas. 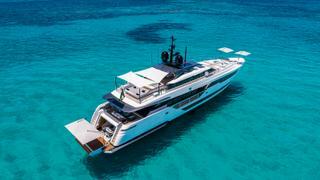 Solo is managed for charter by Northrop & Johnson with a weekly charter rate starting from €595,000. Highlights: Make the most of Solo’s Caribbean cruising grounds up on the sun deck, offering 360-degree views with sofas and sunpads, perfect for an afternoon of sun soaking. Drop down a deck and there’s a bar, Jacuzzi and a touch-and-go helipad that can be transformed into a dance floor. If that isn't enough, she also boasts a six metre aft deck swimming pool and a large superyacht beach club, complete with its own saloon, bar, sauna and hammam. Where to find her: Delivered earlier this year, Solo will be heading across the Atlantic for the first time and will be available for charter in the Caribbean and Bahamas. 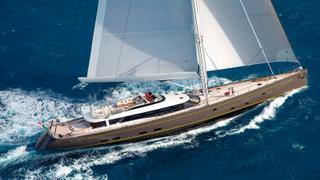 Solo is managed for charter by Northrop & Johnson with a weekly charter rate starting from €595,000. Stats: 58 metre, Benetti, 2014, 12 guests and 13 crew Highlights: This elegant Benetti combines exquisite design with first-class amenities for the ultimate charter vacation. Her contemporary monochrome interior features rich and exotic materials such as walnut, onyx, Lalique crystal and silk, shrouding guests in luxury. Offering the best views on board, Illusion V boasts one of the best superyacht sundecks, with sliding doors for protected al fresco dining, and a large Jacuzzi surrounded by sunpads, loungers, a bar and a barbecue. She's also packed with the latest in water toy tech including a Jetovator, Flyboard, Snuba and Skurfboard. Where to find her: This winter find Illusion V cruising the Central and Northern Caribbean Sea, stopping off in quiet bays so guests can take her waters toys for a spin. 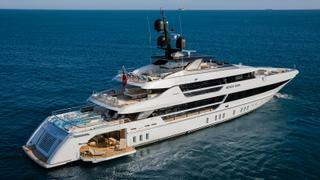 Illusion V is managed for charter by Camper and Nicholsons. Her weekly winter charter rate starts from $350,000. Highlights: This elegant Benetti combines exquisite design with first-class amenities for the ultimate charter vacation. Her contemporary monochrome interior features rich and exotic materials such as walnut, onyx, Lalique crystal and silk, shrouding guests in luxury. Offering the best views on board, Illusion V boasts one of the best superyacht sundecks, with sliding doors for protected al fresco dining, and a large Jacuzzi surrounded by sunpads, loungers, a bar and a barbecue. She's also packed with the latest in water toy tech including a Jetovator, Flyboard, Snuba and Skurfboard. Where to find her: This winter find Illusion V cruising the Central and Northern Caribbean Sea, stopping off in quiet bays so guests can take her waters toys for a spin. 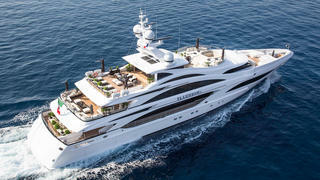 Illusion V is managed for charter by Camper and Nicholsons. Her weekly winter charter rate starts from $350,000. Highlights: One of the largest custom US built yachts, Laurel is packed with things to do. Her transom converts to a swim level playground with an impressive selection of toys including waverunners, towables, a large inflatable slide from the bridge deck, an inflatable trampoline and two giant hamster wheels. There are also two certified dive instructors on board, as well as paddleboards, kayaks and snorkelling gear for those who enjoy a slower pace to their vacation. Inside, her main deck master suite features a sizeable lounge, office, walk-in wardrobes and two private terraces where guests can enjoy stunning sea views both at anchor and underway. Where to find her: This winter season find her island-hopping her way around the Bahamas, Windward and Leeward Islands, Virgin Islands and Cuba. Stats: 52 metre, Sanlorenzo, 2017, 10 guests and 11 crew Highlights: Seven Sins has five cabins and extensive living and dining areas in a modern style. Her standout beach club, complete with a sauna and gym, features a glass-bottomed swimming pool which doubles as an intriguing ceiling for the lounge area below. Guests can head ashore and explore secluded bays with her selection of water toys, including SeaDoos, sea scooters, inflatable canoes and paddleboards. Where to find her: She’ll be diving her time between the Caribbean and South America this winter. 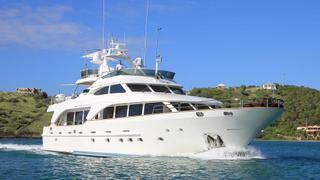 Seven Sins is managed for charter by YPI with a weekly winter charter rate starting at $255,000. Highlights: Seven Sins has five cabins and extensive living and dining areas in a modern style. Her standout beach club, complete with a sauna and gym, features a glass-bottomed swimming pool which doubles as an intriguing ceiling for the lounge area below. Guests can head ashore and explore secluded bays with her selection of water toys, including SeaDoos, sea scooters, inflatable canoes and paddleboards. Where to find her: She’ll be diving her time between the Caribbean and South America this winter. 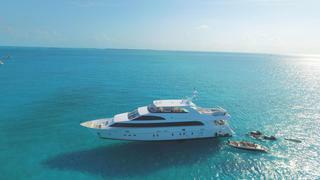 Seven Sins is managed for charter by YPI with a weekly winter charter rate starting at $255,000. Highlights:RoMEA is the perfect option for those looking for rest and relaxation this winter. As well as a beauty salon and massage table on the bridge deck, the beach club features a wellness area complete with a Finnish sauna, natural pebble flooring and a large Jacuzzi. Guests can also kick back and enjoy a film indoors or al fresco, or head to the sun deck and sprawl out across the poolside lounge. Highlights: Ideal for entertaining, Just Enough boasts al fresco dining on the main deck with an aft seating area, as well as a Jacuzzi, sun loungers and a bar on the sun deck. For peace and quiet, guests can sprawl across two large sunbeds on the foredeck or grab a SeaDoo scooter and snorkelling gear for an afternoon of exploring the tropical marine life below. Where to find her: Have your pick of islands on board Just Enough as she spends the season circumnavigating the Caribbean (including Florida, Windward and Leeward Islands, The Bahamas, and the BVIs). Stats: 54.86 metre, Newcastle Marine, 2011, 12 guests Highlights: Sovereign is packed full of upgrades after an extensive refit in 2017, including her updated contemporary-styled main deck featuring a large main saloon and dining area. Of her six cabins, there are two master suites: one is full beam and sits on the main deck, while the upper deck suite boasts 270-degree views with access to a private outdoor seating area. Up on the sun deck there's a tiled infinity pool with a swim up bar, and an elevated forward observation deck. 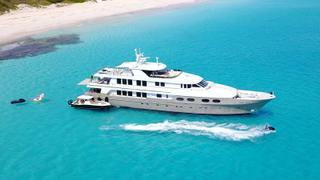 Where to find her: She'll be spending this winter exploring the sandy palm-fringed beaches of the Caribbean and Bahamas Sovereign is managed for charter by Worth Avenue Yachts, with a weekly charter rate starting from $250,000. Highlights: Sovereign is packed full of upgrades after an extensive refit in 2017, including her updated contemporary-styled main deck featuring a large main saloon and dining area. Of her six cabins, there are two master suites: one is full beam and sits on the main deck, while the upper deck suite boasts 270-degree views with access to a private outdoor seating area. Up on the sun deck there's a tiled infinity pool with a swim up bar, and an elevated forward observation deck. 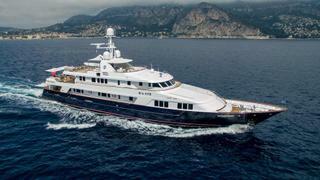 Sovereign is managed for charter by Worth Avenue Yachts, with a weekly charter rate starting from $250,000. Highlights:Loon has had an extensive refitting this year, so accommodation and facilities have been updated to the highest-quality. Her six ensuite bedrooms and cosy living spaces have been finished with an elegant cherry wood panelling and feature animal and tribal print soft furnishings. 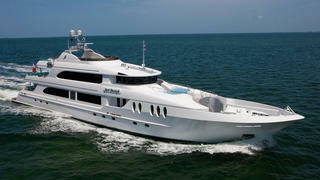 Above deck, she features alfresco dining spaces with a barbeque grill, plus a jacuzzi on her large sundeck. She carries four Yamaha jet skis and has all the equipment necessary for scuba diving and fishing opportunities. Where to find her: This winter Loon will be sailing around the Bahamas. She’ll be in the perfect location for fishing and diving enthusiasts, as the crystal-clear Bahamian waters are bursting with unspoilt marine life. Highlights: This tri-deck yacht is ideal for couples and families and features a bright interior with large windows bringing light into the main social spaces. The main deck master suite has a large bathroom with a steam shower and Jacuzzi, as well as a walkthrough wardrobe and views looking forward. After an audio-visual upgrade in 2017, she also boasts a new 65-inch cinema where guests can watch their favourite films under the stars. Where to find her: This winter she'll be swapping her summer base in the South of France for the warm waters of the Caribbean. Highlights: Refitted in 2014, Blu 470 has a classic interior design with warm wood features in her saloons and five cabins. Her highlights include the custom-built wine fridge below deck and a sundeck jacuzzi. Guests will find that she is stocked with plenty of toys for various waters sports, including Seabobs, waterskis and even a small sailboat. Where to find her: Swap winter weather for rum and sun in the Caribbean, where Blu 470 will be cruising this season. Stats: 95.2 metre, Lurssen, 2014, 12 guests, 28 crew Highlights: One of the most expensive yachts for charter, Kismet offers guests plenty of bang for their buck. Her stunning interior was designed by Reymond Langton and includes a vast master stateroom that has its own private deck complete with a Jacuzzi. Her exterior spaces are equally impressive with a 12-meter mosaic pool located on the upper deck, a basketball court on the foredeck and large sports bar on her aft deck that can be transformed into a nightclub. 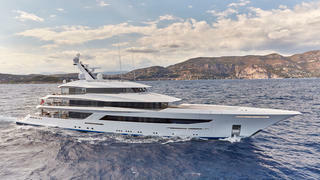 Where to find her: Kismet will be found in her usual cruising grounds of the Caribbean this winter. 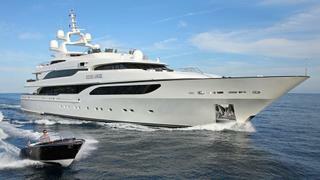 Kismet is managed for charter by Moran Yacht & Ship, with a weekly charter rate starting from €1,200,000. Highlights: One of the most expensive yachts for charter, Kismet offers guests plenty of bang for their buck. Her stunning interior was designed by Reymond Langton and includes a vast master stateroom that has its own private deck complete with a Jacuzzi. 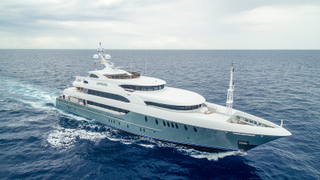 Her exterior spaces are equally impressive with a 12-meter mosaic pool located on the upper deck, a basketball court on the foredeck and large sports bar on her aft deck that can be transformed into a nightclub. 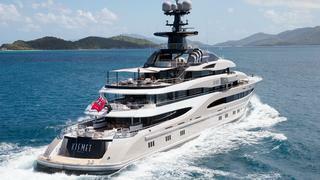 Where to find her:Kismet will be found in her usual cruising grounds of the Caribbean this winter. 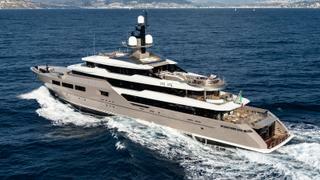 Kismet is managed for charter by Moran Yacht & Ship, with a weekly charter rate starting from €1,200,000.